This is a 3-in-1 reference book. 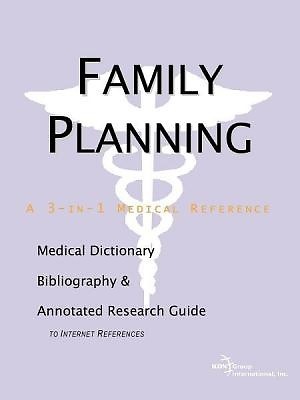 It gives a complete medical dictionary covering hundreds of terms and expressions relating to family planning. It also gives extensive lists of bibliographic citations. Finally, it provides information to users on how to update their knowledge using various Internet resources. The book is designed for physicians, medical students preparing for Board examinations, medical researchers, and patients who want to become familiar with research dedicated to family planning. If your time is valuable, this book is for you. First, you will not waste time searching the Internet while missing a lot of relevant information. Second, the book also saves you time indexing and defining entries. Finally, you will not waste time and money printing hundreds of web pages.